AUSTIN, Texas — State Senator Konni Burton (R-Colleyville) made headlines last week for wearing custom-made boots with a “Stand for Life” logo when she was sworn into office, and her Democrat predecessor, Wendy Davis, was unable to resist firing some parting shots at her, calling the boots “a kitschy statement” and attacking Burton’s commitment to protecting Texans’ constitutional rights. As Breitbart Texas reported, Burton wanted to send a strong pro-life message on her first day representing Senate District 10, and viewed her boots as the perfect counter to the pink Mizuno sneakers that Davis made famous during her 2013 filibuster against Texas’ abortion law. 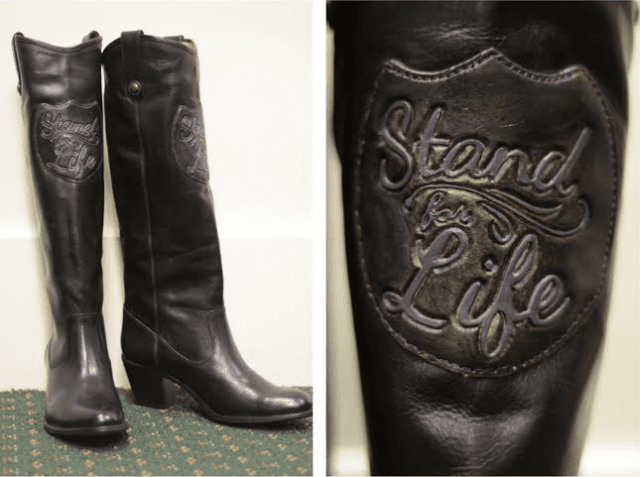 The “Stand for Life” logo on Burton’s boots was inspired by the #stand4life hashtag that pro-life activists adopted during Davis’ filibuster. Breitbart Texas has not yet uncovered any statements by Burton regarding any constitutional freedoms she intends to ignore, but Davis found herself the target of Second Amendment supporters earlier this month after she admitted that she made a mistake backing the open carry of firearms, and that she was only doing so to get votes. Davis lost the governor’s race to Republican Greg Abbott by double digits, but she told Fikac that she is likely to run for office again, although she had not decided which one. She is scheduled to speak at upcoming Planned Parenthood events and has promised to be “a voice” during this legislative session.